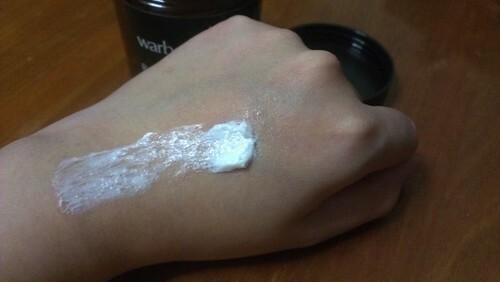 I am glad to finally bring yet another review and fulfill yet another goal in my super long organic product wishlist: to try Warbotanicals products after finishing my existing shampoos! Particularly their rose products since i love rose scents as they make me feel really happy and at peace inside! And I am happy to say i loved my experience with these products! 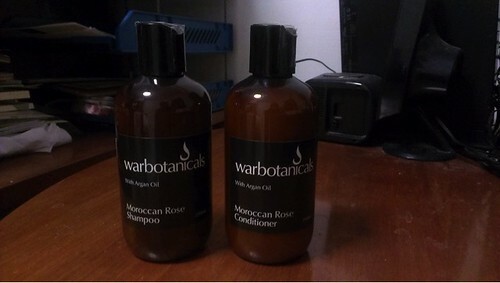 I was introduced to Warbotanicals when i was reading KATJUJU’s lovely product review on the Moroccan Rose Shampoo and Conditioner. Warbotanicals is a brand of handcrafted and natural products by Donna Fowler and her partner Richard from the Yarra Valley in Australia. Apart from containing naturally derived ingredients, their products do not contain synthetic chemicals such as parabens, Sodium Lauryl Sulfate and synthetic fragrances. The first parcel above contained the Moroccan Rose shampoo and conditioner. 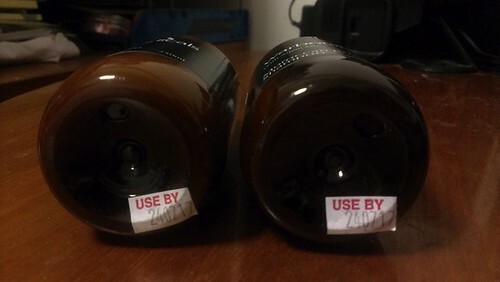 Nice work with the scotch tape sealing on the caps. The shampoo (right) had a clear, thick and gel like consistency. The fragrance had a strong rose and argan oil scent coupled with something mint-like (maybe the basil or the tea tree oil) . 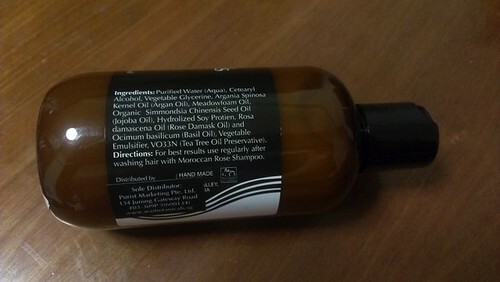 Conventional shampoos often contain synthetic sulphates or SLS to enable shampoos to produce more foam and clean better. However, sulphates are toxic and are strong cleaning agents used in car and floor cleaning products, which may cause scalp or skin allergies in people. I am pleasantly surprised that for a shampoo with no sulphates as a foaming agent, it foamed up really well, which is a plus for an organic shampoo as the organic shampoos i had tried usually do not produce a lot of foam. It gave a super clean feel to the hair, without the SLS. The conditioner (left) had more of a creamy lotion-like consistency and slightly runny. It had a similar rose scent, just more subtle and slightly more minty. After leaving the conditioner in my hair for five minutes , rinsing off and blowdrying , my hair became much lighter and smoother and more manageable. The slightly soft plastic bottle packaging for both shampoo and conditioner made it rather easy to squeeze the product out for the most part. The very last portion of the product did take some amount of shaking and light hitting to get it out of the bottle though. To dispense the product, I had to press down the side of the cap and the opening would pop out of the other side of the cap where I would squeeze the product out. I thought this was a pretty neat and drip proof way of dispensing the product, especially with wet hands. I only needed to simply press down on one side to dispense the product (compared to screwing and unscrewing a bottle cap with wet hands). After that, I could simply press down on the opening to close it to prevent the product from leaking out. Despite the fact that both rose fragrance fusions are particularly unfamiliar to me, I grew to love both fragrances eventually. Both fragrances were strong but not too overpowering, which is great. The argan oil in both products really helped to moisturise and make my hair more soft and manageable. 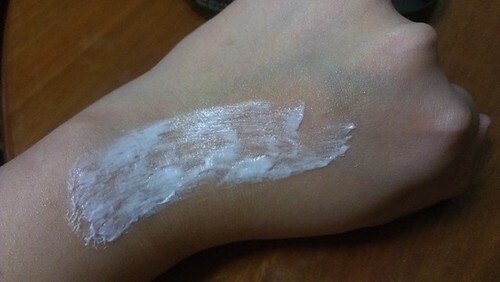 My scalp also became less oily. The calming rose fragrance that was left in my hair after using both products contributed to a relaxing and elegant bath experience. As you can see here, all natural ingredients on their labels. Super moisturising argan oil, rosa damascena and jojoba oil and other lovely oils for the skin and hair. 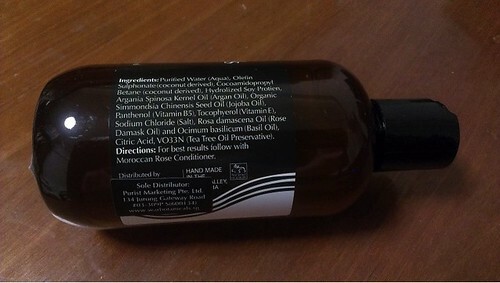 Even more interesting is tea tree oil as a preservative. No worries about funny chemicals that I wouldn’t know and i know what kind of beneficial ingredients I am feeding my hair. 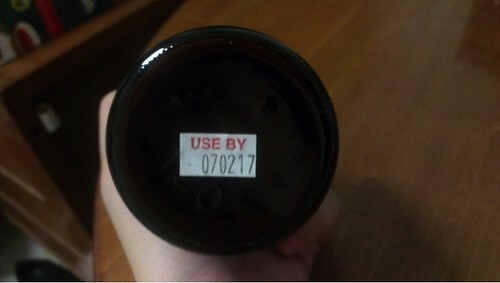 Their expiry dates, useful important little details. I opened the second package. It came as a surprise gift as i was wondering, wait what else did i order? 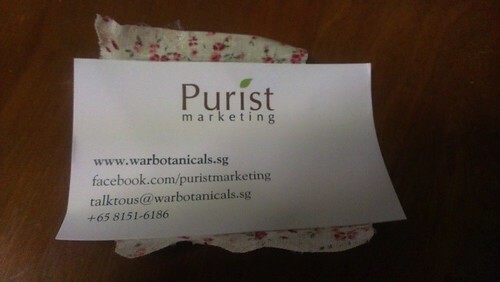 Through this lovely note by Purist Marketing, i realised what it was. I had a chat with them over Facebook and among other things, had mentioned about how i loved rose scents and about this blog i had recently started. 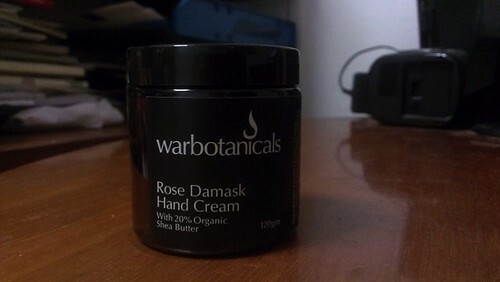 It's the Rose Damask Hand Cream! Through my browsings of their online shop I had always thought of trying it and put that into my mental wishlist. I had never quite expected that it would come to me as an additional gift and i’m really grateful for this. 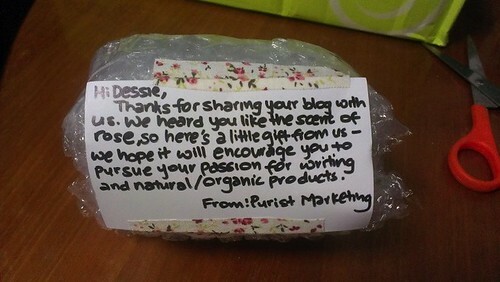 Thank you Purist Marketing for the gift too! Will use it well! 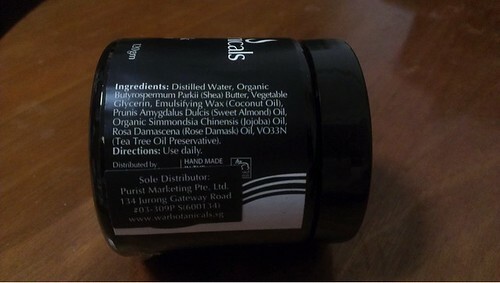 A look at their ingredients list…moisturising organic shea butter, rose damascena, coconut, sweet almond and jojoba oils. And tea tree oil preservative pops up again! The cream has a really pleasant and unique rose scent which i love. 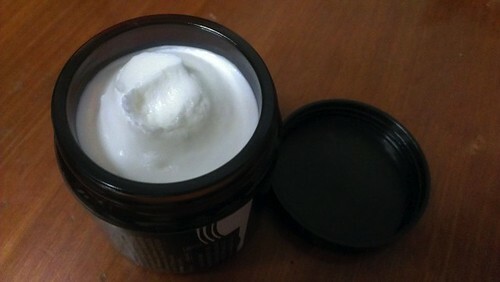 It also has 20% super moisturising organic shea butter! I do find myself opening up the jar to sniff it every now and then. Crazy! The consistency is a little thick and harder to spread, so a little bit does go a long way. 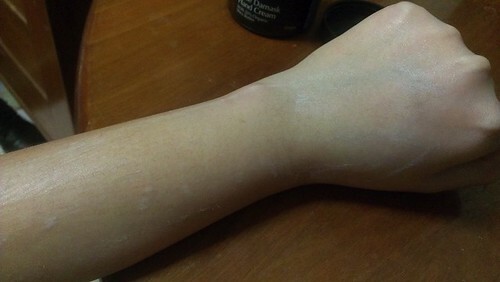 This is shown as the amount i placed on my hand (above picture) actually spreads beyond my hand area (below photo) in order for the cream to be completely rubbed into the skin. 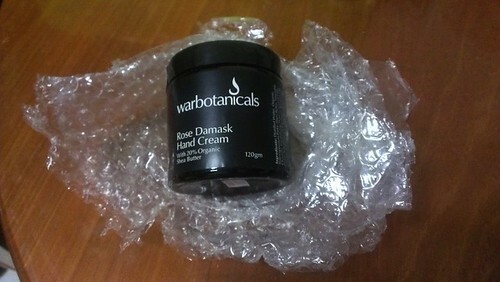 My hands (and forearms) do feel lovingly soft and smooth with a non greasy feel after using the cream. Another plus: My job involves quite a fair bit of manual work so this cream does help with softening my hangnails that tend to form as well. The slight heavy glass jar it comes in means it would be more for home use and not suitable for the outdoors. But i suppose that could be solved if one doesn’t mind purchasing/finding a small jar with a spatula to transfer some of the cream to make it more travel friendly. Ideally, it would be more hygenic if the product came with a spatula as opposed to using fingers, but i don’t really mind the slight trouble of washing hands before using the cream. Aside from the few cons mentioned earlier about the packaging, my overall experience of these products was really positive. My hair became more manageable and my scalp was less oily and had less of an odor than it used to. My hands were well cared for and conditioned. The fact that they are all rose scented is a major plus. Price wise, I would say they are reasonably well priced, not too pricey. The shampoo and conditioner both retail for SGD 23 online. There is also the option of purchasing both of them as a set at SGD 45, which i did. As you can see from their name card below, one can keep in touch with them via phone, email or Facebook for the latest information on new products, offers and occasional events that they are going for (a great way to sniff and experience the products before deciding on your purchase). 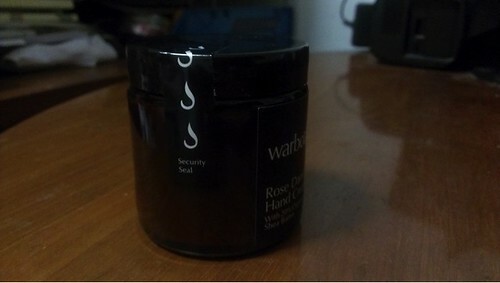 Have you tried any Warbotanicals products before? How was your experience with them? Let me know in the comments below!